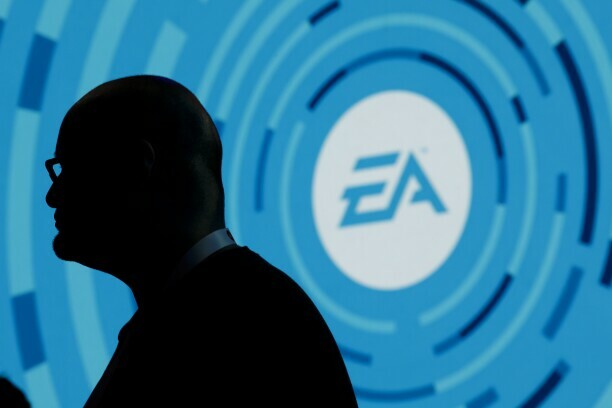 The silhouette of an attendee is seen standing in front of a Electronic Arts Inc. logo displayed on a screen during the company's EA Play event ahead of the E3 Electronic Entertainment Expo in Los Angeles on June 9, 2018. The U.S. District Court for the Northern District of California “has been informed” that the parties settled, Judge Richard Seeborg said in a March 28 filing. The apparent agreement came months ahead of trial after the court repeatedly rejected EA’s defenses for unlicensed use of the players’ likenesses. The video game company had licensed current players’ image from the NFL Players Association, but “historic teams” rosters in the game featured retired players not covered in the deal. Under California’s right-of-publicity law, video games featuring athletes playing the sport for which they were known isn’t a transformative use that carries intellectual property rights. Courts often use a transformative-use test to balance publicity rights with First Amendment free-speech protection. Details of the settlement weren’t immediately available. Counsel for both sides didn’t immediately respond to requests for comment. The players sued EA in 2010 over use of their likenesses in Madden under California’s right-of-publicity law. The players said that while the game didn’t use names or correct jersey numbers, the players were readily identifiable by historical team, position, height, weight and relative skill at different aspects of the game. EA moved to dismiss the case under California’s anti-SLAPP law against lawsuits brought to squelch speech. EA argued its use of the players’ likenesses use was transformative, incidental and in the public interest. Seeborg rejected the bid in 2012, and EA appealed. EA asked the U.S. Court of Appeals for the Ninth Circuit to apply the Second Circuit’s 1989 ruling in Rogers v. Grimaldi, a case that another Ninth Circuit panel cited in 2013 when it dismissed former NFL star Jim Brown’s false endorsement claim against EA. But the Ninth Circuit in 2015 said right of publicity law “does not primarily seek to prevent customer confusion,” unlike trademark law addressed in Rogers. The appeals court instead looked to its 2013 ruling in Keller v. Electronic Arts Inc., a right-of-publicity case in which the court held that EA’s use of players’ likenesses in its NCAA Football game wasn’t transformative. The Ninth Circuit said the claims in Keller were “materially indistinguishable” from the NFL players’ claims. The appellate court also rejected EA’s argument that the NFL players’ likenesses were incidental to the expressive work because the video game, designed to create an accurate simulation of an NFL game, featured them prominently. The Supreme Court declined to take up EA’s petition in 2016. The case returned to the Northern California court to resume discovery. The court had scheduled a trial for September. Henri Law Group represented the players. Keker Van Nest & Peters LLP represented EA.